Her career as make up artist starts in 2003 when she obtains the make up artist certificate with specializations in cinema/television, photographic and corrective make up at BCM Milan Academy. From then on, the doors of the professional make up sector start to open: she collaborates with the most important and prestigious cosmetic companies becoming trainer and International Make Up Artist with the opportunity to work in the most beautiful cities in the world. The Milanese fashion sector allows her to enter in the world of fashion as a make up artist on the occasion of the fashion weeks for luxury sector stylists, for editorial and advertising campaigns of global level. In 2005 she is among the winners of one of the most sought after places at the theatrical make up and hairstyle course of Accademia del Teatro alla Scala, where she picks up backstage secrets and learns to create and restore wigs, fake facial hair, historical hairstyles, theatrical and artstic make up. Enraptured by the charm of the theatre world, she starts to collaborate as a make up artist and hairstylist for Teatro Alla Scala in Milan and for other important Italian and international opera houses. However, the theatrical experience does not represent the only expression of art that she likes to master. For the television, she collaborates as a make up artist in both Mediaset and Rai productions and for the production of fiction and advertising spots, becoming Personal Make Up Artist for different artists. 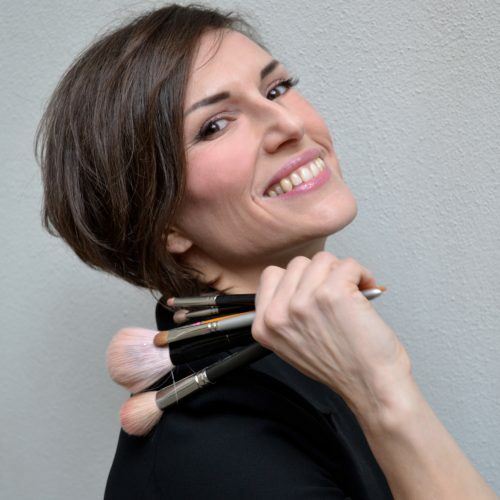 Currently, teaching has become an integral part of her life; for years she has collaborated with the best and the most prestigious Make Up Academies to train professional make up artists and she dedicates herself to personal make up courses too, while continuing the collaboration with Teatro Alla Scala which has lasted for 12 years. In my opinion, bridal make up has always represented an important moment of professional, creative and interpersonal relationships. According to me, it is a source of great satisfaction to interpret the brides’ personalities and make them feel comfortable in one of the most important moments of their life. I play with colours and highlight the natural facial beauty, without altering the personal characteristics, using the “Fitting Make-up” method, a new make up concept that does not alter, but enhances, the person’s natural beauty. Putting make up on a bride means offering a fundamental support, not only aesthetic, but also in achieving the dream of a lifetime: an adequate make up developed in a friendly atmosphere contributes to making the bride feel at ease, ready to be the center of attention. And this is what I would say each and every time and that gives me the greatest satisfactions.